Luxury is a state of mind. It is a feeling of satisfaction created by a pleasurable and sensuous environment that also achieves a high level of comfort. What you wear, what you eat, and the aromas you breathe, pamper the mind and body into a state of happiness. But luxury is also ever-changing. Luxury homes, for instance, have been evolving. The high-ceilinged baroque mansions surrounded by acres of manicured lawns shaded by leafy oak trees, which spelt luxury in the colonial era, have given way to a more modern, urban culture of smaller functional spaces defined by gadgets and speed. This period, too, has evolved into a combination of old and new - a hankering for old-style comfort in a modern setting. It is now the era of 'villas in the sky', and the acres of oak and lawns have morphed into a golf course that lets you imagine the rolling greens to be an extension of the drawing room. "The farmhouses on the edge of Delhi have given way to the luxury apartments overlooking golf courses," says Anshuman Magazine, CEO of broking house CBRE India. "This new community living lets you move easily from playing golf to entertaining friends in a fine dining restaurant to even hosting a business delegation." For instance, DLF's The Camellias in Gurgaon's Golf Course Road, has 4-5-bedroom apartments of 7,200-9,400 sq. ft - larger than many independent mansions. From a nanny-equipped crèche to conferencing areas to even a 25-seat cinema auditorium on hire, the complex is opulent in features and offerings. At Rs 35,000 a sq. ft, these residences are upward of Rs 20 crore. "The new frontier is size and services," says Magazine. 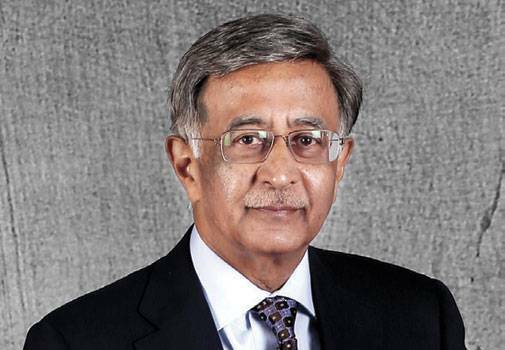 Giving a brass tacks view, Pankaj Kapoor, CEO of realty tracking agency Liases Foras, says premium luxury can be defined by four factors - quality of the product, the distance from city centres and transport hubs, the surrounding environment, and the price. While quality and surroundings are constant across cities, luxury pricing varies sharply from city to city. In Mumbai and Delhi-NCR, where land prices form as much as 50-70 per cent of residential products, a premium luxury home comes for Rs 10 crore or more. In Chennai and Hyderabad, a similar 5,000-sq. ft apartment can be sought out in the Rs 5-10 crore range. Luxury is identified with spacious surroundings. In Delhi-NCR, the newly launched ATS Knightsbridge project on Noida Expressway has apartments ranging from 6,000 sq. ft to 10,000 sq. ft, probably larger than colonial mansions in Surrey, England! 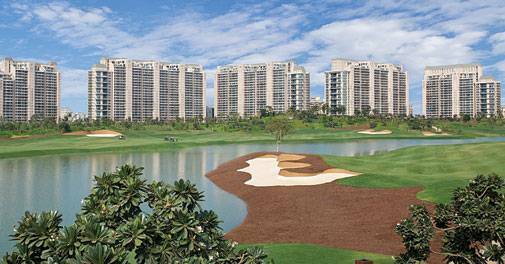 Similarly, in Gurgaon's Golf Course Extension Road, the branded Grand Hyatt Residences launched recently start at 4,600 sq. ft with offerings of 5,900, 8,000 and 10,000-sq. ft residences. In Mumbai, high-rise luxury apartments currently on sale offer space and grandiose views. Omkar Realtors' Worli project - '1973' - offers three cylindrical towers rising over 70 floors. The four-bedroom 'show' apartment has two key defining features - a ceiling height of 13 ft that gives a sense of large space, and decks or verandas extending from each bedroom that could be larger than the bedrooms. Viewing the lights of the city from over 200 metres in the sky or watching small dots that are ships off the west coast of the Indian Ocean can be exhilarating. These homes start at Rs 14 crore, but for 20,000 sq. ft penthouses on the 70th floor, the asking rate could be as much as Rs 80 crore. "For even the very wealthy in Mumbai, owning a bungalow is impossible because of the land cost; the next best thing is to give them palatial homes in the sky," says Amit Parsuramka, Omkar's Chief Marketing Officer. Lodha's World One Tower in Parel is into its seventh year of construction. The last time this writer came four years ago, work had just started, and the show flat was a simulated version. This time round, an 'Armani Sky Villa' is on display on the 43rd floor. The tower will eventually rise to a mind-boggling 117 floors. The open decks that run around the apartment give a south view of the island city, gradually narrowing till it meets the ocean at Navy Nagar. The Armani stamp is there in the design - flush doors that merge into the wall, no garish extrusions, neutral pastel colours on the floor and tapestry; and dim, unobtrusive lighting. Priced currently at Rs 18 crore, it could go up as 'World One' comes closer to completion. The neighbouring tower 'Crest' - part of Lodha's 17-acre complex that was once Srinivas Mills - is almost complete, and is less expensive. A three-bedroom apartment with smaller decks and no 'Armani' finishes comes at Rs 10-12 crore. Being a kidney bean-shaped building, all the rooms are curved triangles. The new genre of 'super-luxury' apartments are sold as 'shell flats', where the buyer chooses and customises the smallest detail in interiors, furniture and gadgetry. The builder concentrates on providing services. As insecurity in the big, bad world increases, the demand for security has grown among those investing in high-value homes. Digital monitoring of guests and of entry points, CCTV cameras, electronically operated double doors, high-tech locking systems, and escorting guests and visitors by security personnel are today all part of the security arsenal that are basic to luxury homes. Facilities like a clubhouse with a gym, squash and tennis courts, and a swimming pool, are now deemed necessary but passé. Newer services are focused on providing business networking and making it easier for the families to manage their other needs. DLF's The Camellias, for instance, provides business conferencing facilities, which include secretarial help and audio-visual facilities for business presentations. Omkar's '1973' will have an indoor tennis court, a pet clinic for your favourite pooch, and a day-care centre for the kids when the lady of the house goes shopping. Another new entrant in 'super luxury' homes is fine dining restaurants. In the new towers, these are positioned at the top - penthouse levels that give exotic views and food! In Lodha's Trump Tower in Mumbai's Parel, the offering includes 'White Glove' services, an international brand that provides private butlers and maids for a fee. If the premium luxury segment has been selling more units, the inventory across metros has also been piling up. Data collated exclusively for Business Today by Liases Foras, a residential property tracker, showed the wealthy in Mumbai snapping up 561 units priced at Rs 10 crore or more in 2015/16 compared to just 235 in the previous year (see Flying High). In Delhi-NCR, too, the premium segment more than doubled sales to 215 units in 2015/16 from just 97 in 2014/15. However, unsold stock was much higher. In Mumbai it rose to 3,718 units from 3,072; and in Delhi it was at 838 and 758 units, respectively, for 2014/15 and 2015/16. The premium luxury segment in terms of volume represents just about 1-2 per cent of the total sale of residences across the six metros. Interestingly, builders' attempts to carve out an 'ultra-luxury' segment, pricing units at Rs 50 crore or higher, have not been successful. None of the cities has shown any sales of units in this category. In Mumbai, too, in the past two years, data shows sales of just three units above Rs 50 crore. Lodhas' 'World One' was initially floated as mansion-in-the-sky with prices in the Rs 60-100 crore range, but these have been cut down in size and prices as they found no takers. "Demand has dropped off in recent years for high-end luxury homes," says Pankaj Kapoor, CEO of Liases Foras. "The salaries and numbers of high-paid professionals have stagnated, and builders overestimated the demand from this section." So, why are builders still continuing to push this segment? It is a factor of the boom period, when builders bought urban land at astronomical prices. "If the land purchase is at Rs 30,000-a-sq. ft, the builder has to build and market high-end products to get a decent return on investment. They are being forced to do luxury," says Kapoor. Another marketing trick is to brand these homes after celebrities. Lodha's project in Parel called 'The Park' has a branded 78-storey 'Trump Tower' named after US president aspirant Donald J. Trump. The tower will have a golden, champagne look, in line with Trump's other branded chain in New York, Makati and Panama. In the unlikely chance of Trump making it to President in November, the Lodhas will surely benefit. For now, three-bedroom homes in Trump Tower are selling in the Rs 10-11 crore range; and if you want a penthouse at the top, be ready to shell out Rs 22 crore. This includes a Jacuzzi in the bathroom, a TV screen, and toilet seats that open when you open the door. 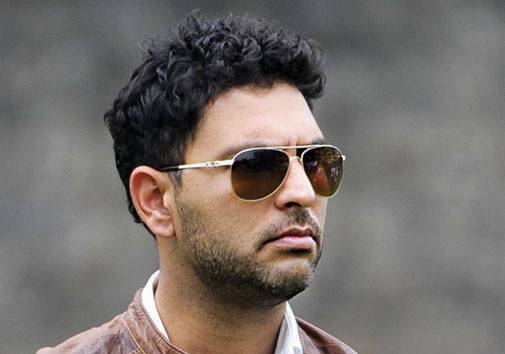 Another ploy to improve branding is to have a cricketer or a film star buy into a project early on, and then tom-tom it. 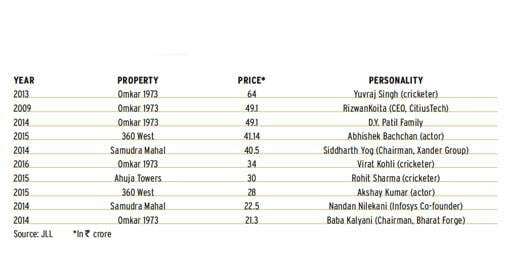 Virat Kohli picking up a super-luxury apartment in Omkar 1973 for a reported Rs 34 crore has become a unique selling point. Does it work? Omkar's Parsuramka says he has prospective buyers demanding to be a neighbour of Kohli. The cricketer, however, has cleverly booked a 'refuge' floor - where his is the only apartment! 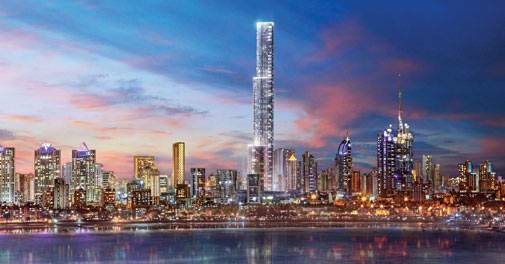 Interestingly, a recent report released by realty brokers Jones Lang LaSalle (JLL) on the transformation of south Mumbai's Worli - from a Koli fishermen's enclave and slums to a luxury precinct - had a lot to do with a celebrity rush. 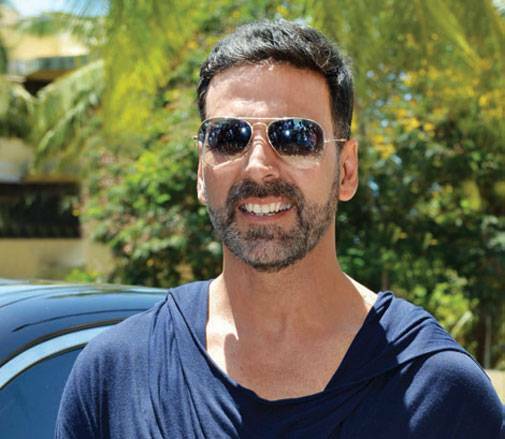 Kohli's teammate Rohit Sharma picked up an apartment in Ahuja Towers for Rs 30 crore, while actor Akshay Kumar booked one in Worli's Vikas Oberoi project called 360 West for Rs 28 crore (see table Top Property Buyers in Worli). Branding is not limited to posh urban luxe towers. Stylists and designers are putting their creative energy into great lifestyle and second home destinations like Goa. 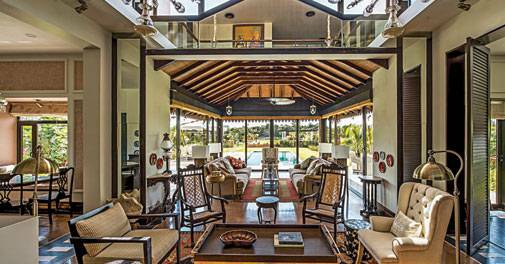 Designer Tarun Tahiliani, for instance, is partnering Goa's home designer and builder Suraj Morajkar, whose Sun Estates promises bungalows, estates and even apartments that capture a taste of old, Portuguese Goa. Right now, Morajkar and Tahiliani are building four 'bespoke' villas on the outskirts of Candolim, Goa. Each is customised and different, set on around half an acre of land on a plateau near Bhattim village. "They are not on the sea coast, but overlook breakwaters and paddy fields - the real Goa," says Morajkar, adding that each residence is unique and often customised to fit the buyer's needs, and will be priced between Rs 12.5 crore and Rs 14 crore. The spirit of the interiors and façade is based on Goa's style of large courtyards, double-height ceilings, and what he calls 'indoor-outdoor' feeling. "We use pottery and refurbished antiques sourced from local artisans and elsewhere to give that quaint rustic charm," he says. Not a 'volume' builder, Sun Estates has delivered 300 unique villas and homes in Goa over the past 20 years. Then, four ultra-luxury units are being done by SK Infrastructure under the brand 'Signature Villas' in Aundh on the periphery of Pune. In configurations of 5,300 and 7,400 sq. ft, these villas will have landscaped gardens and large terraces. Internally, the homes will be serviced by designer lifts, high-class Brazilian wood, a private pool, and automated toilets. Being not too far from the city centre, these types of homes bridge the distance between what are typical weekend 'farm houses' and daily urban apartment living. Let us digest one hard fact - the super luxury market is a tough one to handle. The Lodhas realised it early on when they tried to market 16,000-sq. 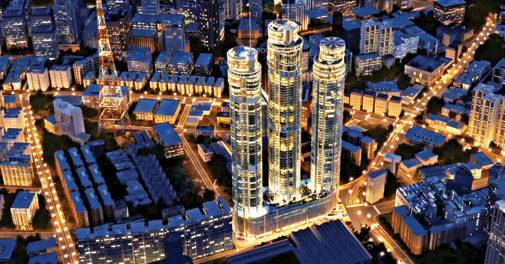 ft duplex 'sky mansions' above the 80th floor in the World Towers at prices in the Rs 70-100 crore range. Every wealthy family is not a Mukesh Ambani seeking an Antilla. Buying homes at Rs 100 crore does not come easy. So, yes, the ticket sizes have gone down, but the services and product are on the up. "The super luxury market is end-user-driven. Today it is a buyer's market, and with the builder always facing a cash flow problem, he wants a deal at any cost. Prices can be bargained down," says Ashwinder Singh, realty broking house JLL's head of residential sales. For luxury homes, negotiations often go on as long as four months, and the final deal can happen with 20 per cent or more shaved off the brochure prices. With these tight conditions likely to continue for possibly several years, it may be a good idea to go out and explore with a wad of cash and a glint in your eye.